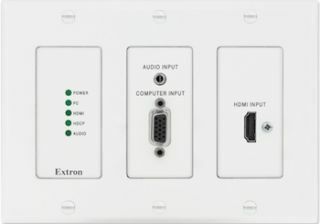 Extron Electronics has introduced the new FOX T UWP 302, a two input fiber optic transmitter for long haul transmission of HDCP-compliant HDMI, RGBHV, or HD component video and stereo audio signals over fiber optic cabling. Engineered for convenience, reliability, and image performance, this Decora-style wallplate transmitter uses all digital technology to provide perfect pixel-for-pixel transmission of images up to 1920x1200, including HDTV 1080p/60. Analog signals are digitized to ensure high quality transmission. The transmitter also provides a host of integrator-friendly features, such as EDID Minder, Key Minder, audio embedding with gain and attenuation control, auto-input switching, and real-time system monitoring. The FOX T UWP 302 is ideal for a wide range of applications that require long haul transmission of high resolution digital and analog AV content in a wallplate form factor. "AV system designers and integrators often need to send digital and analog video signals over fiber optic cable from a single location," said Casey Hall, vice president of sales and marketing for Extron. "The FOX T UWP 302 provides both HDMI and VGA inputs in a convenient wallplate design that blends with any environment." The FOX T UWP 302 occupies a three-gang space, and is available in multimode and singlemode models. To simplify integration and system operation, EDID Minder manages EDID communication between sources and destination, and Key Minder continuously authenticates HDCP encryption for use with protected content. Analog stereo audio signals are converted to digital audio for high quality signal transmission over long distances. As part of the extensive line of FOX Series fiber optic products from Extron, this transmitter is compatible with FOX Series HDMI, DVI Plus, DVI, and VGA receivers. The FOX T UWP 302 can also be used in combination with FOX Series matrix switchers for HDCP-compliant signal distribution systems up to 1000x1000 and larger.